Steve Ballmer will leave Microsoft within a year. Whether inspired by pressure from the board, feeling the noise from sizable shareholders like ValueAct, or experiencing a loss of appetite for fighting market forces, not quite a month after going public with a major company reorganization, Steve Ballmer has announced that he'll be leaving Microsoft within the next year. 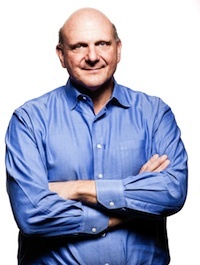 As Ballmer noted in a memo to employees, his original thinking was to retire somewhere in the middle of the company's "transformation to a devices and services" operation. That's the reorganization that has just been launched. Instead, Ballmer acknowledged, "We need a CEO who will be here longer term for this new direction." He'll stick around long enough, he said, for a replacement to be hired. News of the pending departure sent Microsoft stock into overdrive. Trading activity is nearly four times the average, and the share price is currently up about 7 percent. By quitting, noted Forbes columnist Bruce Upbin, Ballmer made almost a billion dollars in gain on his 333 million shares. (The actual amount at this point is closer to $729 million.). Quoting from FactSet data, Upbin noted that since Ballmer's ascendance to the CEO position, the company has had a "negative total return" of 18 percent, and the stock value has dropped by more than a third. According to ComputerWorld coverage, Ballmer was ousted by the directors because the company had to take a $900 million write-off based on an "oversupply of the firm's struggling Surface RT tablet." That was the assessment of Moor Insights & Strategy analyst Patrick Moorhead. That opinion, the article said, was bolstered by a statement made by Ballmer in his memo: "I take this step in the best interests of the company I love; it is the thing outside of my family and closest friends that matters to me most." The search for a replacement will consider both internal and external candidates, a company statement said. The hiring committee will be led by John Thompson, current CEO of Virtual Instruments and former CEO of Symantec who joined Microsoft's board of directors in February 2012. The search group will also include Microsoft's Chairman, Bill Gates, as well as Audit Committee Chairman Chuck Noski and Compensation Chairman Steve Luczo. The team will work with recruiting firm Heidrick & Struggles to identify leading candidates. This is the same company that was reported to handle the placement of Marissa Mayer as CEO of Yahoo. Yahoo recently knocked Google out of the running for most visited Web site in the month of July, and its share price is up about 73 percent since her arrival in mid-2012. In Microsoft's press release about the retirement, Gates was fairly tight-lipped regarding the leadership change. "As a member of the succession planning committee, I'll work closely with the other members of the board to identify a great new CEO," he was quoted as saying. "We're fortunate to have Steve in his role until the new CEO assumes these duties." Ballmer used his staff memo to share what he saw as the gains made by the company in the time he has been there; he joined in 1980 as a business manager and employee No. 30. "We have grown from $7.5 million to nearly $78 billion since I joined Microsoft, and we have grown from employing just over 30 people to almost 100,000," he stated. "I feel good about playing a role in that success and having committed 100 percent emotionally all the way. We have more than 1 billion users and earn a great profit for our shareholders. We have delivered more profit and cash return to shareholders than virtually any other company in history." Ballmer also reminded his readers that he still maintains — and expects to continue holding — a sizeable stake in the company: "I cherish my Microsoft ownership, and look forward to continuing as one of Microsoft's largest owners."